Lewis Hamilton has topped both Friday practice sessions in preparation for this weekend’s 2015 Hungarian Grand Prix in Budapest. The Mercedes driver was faster than both his team-mate and the quick but unreliable Red Bulls to get the best start to the weekend that he could hope for. Lewis Hamilton has the chance this weekend to become the most successful driver at the Hungarian Grand Prix. He is currently level with Michael Schumacher on 4 wins, with a 5th on Sunday making him the winner of the most races in Budapest since it arrived on the calendar in 1986. 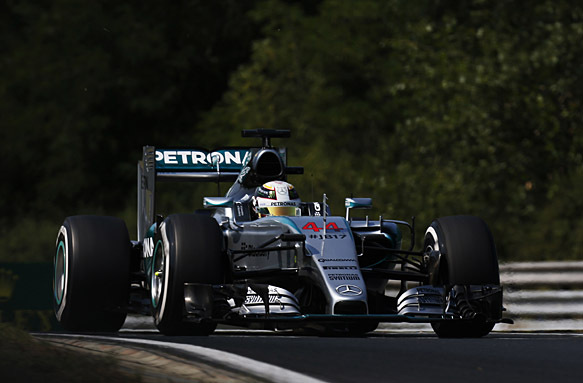 Hamilton started his Hungarian weekend as the fastest driver after setting a 1’25.141 in the first practice session. He was tenth of a second faster than team-mate Nico Rosberg, who closed up almost a one second deficit in the final half an hour to take 2nd fastest. Kimi Raikkonen was 3rd fastest for Ferrari and was 6 tenths down on Hamilton, with the Finn’s session coming to a premature end when his front wing failed in the final sector. Debris scattered the circuit causing one of two red flags in the session. Raikkonen’s team-mate Sebastian Vettel finished the session in 6th; with the two Red Bull’s separating the Ferrari duo. Top end engine grunt isn’t as vital in Hungary as it is at other circuits, which allowed the Red Bull drivers to both be within a second of Hamilton in P1. Carlos Sainz was 7th fastest for Toro Rosso ahead of Sergio Perez; who stole the headlines in practice 1 after a strange crash. The Mexican was just about to enter the final sector when his right rear wheel failed. The car snapped around into a high-speed spin which put Sergio into the inside barrier, the left-front wheel then tucked itself underneath the Force India, which pitched the car into a roll. Sergio clambered out of his upside-down car unhurt but surprised; initially believing that the incident was his fault. The car would need extensive repairs to get out on track in FP2. Valtteri Bottas ended the session 9th fastest, with the Finnish driver testing out a new front wing design. Valtteri and team-mate Felipe Massa had spent most of the session languishing down in the lower reaches of the time-sheets; Massa finishing the session in 14th. The team were happy with the new wing, with a Williams engineer saying it was doing exactly what they thought it would. Following Bottas was Max Verstappen in 10th fastest for Toro Rosso. Two test drivers were scheduled to head out on track during the session, with Fabio Leimer making his Formula One practice debut for Manor and Jolyon Palmer set to drive Romain Grosjean’s Lotus yet again. Leimer ended the session 19th after being ahead of team-mate Will Stevens for much of the session. Palmer didn’t set a time in the session after a late financial dispute with Lotus and Pirelli relegating him to the garage for most of the 90 minutes. Hamilton continued to hold his advantage out front by setting the fastest time in the second practice session later on in the day. He improved upon his FP1 time by 1.2 seconds to set a 1’23.949 in his qualifying simulation. The pace of Red Bull continued to improve in the second session, with Daniil Kvyat and Daniel Ricciardo impressively ending the session 2nd and 3rd ahead of Nico Rosberg in 4th. The team looked to have good pace on qualifying and race simulations, meaning that they could well challenge for their first podium finish of the year at the sight of Ricciardo’s win a year ago. Unfortunately for Daniel, his Renault engine expired in the middle of the session, but thankfully he won’t get a penalty as it wasn’t his race engine. He kept his smile as he walked back to the garage, saying that he was still pleased by the day’s running. Rosberg ended the session 4th fastest, 7 tenths down on his team-mate and 2 tenths down on Ricciardo in 3rd. Rosberg was a few tenths quicker than Raikkonen in 5th and Carlos Sainz in 6th; who continued to show good pace for Toro Rosso. 7th fastest was Sebastian Vettel, who had a messy session where he didn’t look as comfortable in the car as he would hope after several spins over the course of the 90 minutes of running. He ended 1.7 seconds down on Hamilton. 8th fastest was Fernando Alonso, who proved that straight-line grunt wasn’t vital here by putting his McLaren-Honda in the top 10 ahead of the Williams pair of Bottas and Massa in 9th and 10th who are usually the quickest in the speed traps. Button wasn’t too much further down in 12th place; with the British driver being rumored today to be in with a chance of moving to Williams next year should Bottas replace Raikkonen at Ferrari. Both Force India drivers remained in the pits for the whole session following Perez’s crash in the first session. Work was still ongoing on Perez’s #11 car, with the team choosing not to run Nico Hulkenberg whilst they worked out what caused the crash for Sergio. As a result, both Manor drivers finished in 17th and 18th, with Roberto Merhi pipping Will Stevens by 2 thousandths after an impressive save at turn 4.